Hey Friends! 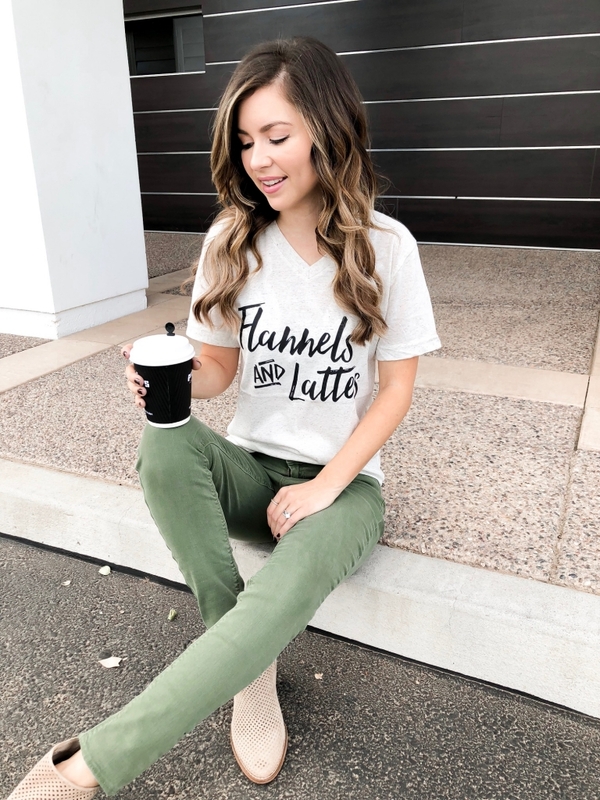 Do you love a fun graphic tee? Me too! Today I wanted to share 2 ways I have recently styled this fun fall graphic tee. During the holiday’s I love wearing all of my graphic shirts and sweaters especially ones that have cute sayings! I have this one that has the cutest penguin skiing that I always crack up when I wear it. When it comes to styling a graphic tee you could go two ways. Just cease it’s a tee doesn’t mean you casual is the only way to style it. Since I do love my casual outfits lets start with that one first. Weather your grabbing coffee or running errands a casual outfit is a good way to go. Sometimes after photoshoots Chris and I like to grab coffee so this outfit is perfect. For this casual look I paired this graphic tee with olive green pants and ankle boots. You could easily wear it with jeans as well I just really liked a pop of color. Now that I think about it a denim jacket over this would be lovely too. As I had mentioned above a denim jacket is a great way to make a look more casual but a blazer can create a different look. 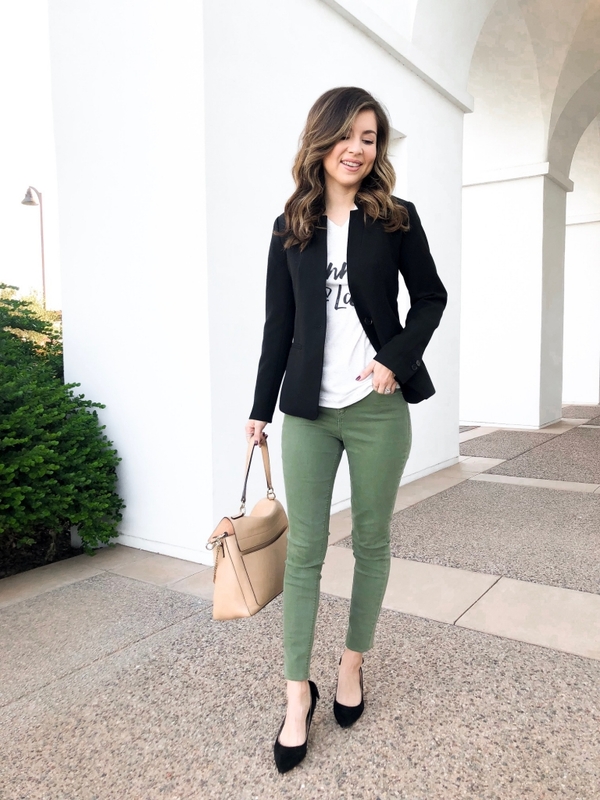 To dress up this graphic tee a bit I put on a black blazer with black heels. Just by adding these two things it completely changed how this graphic shirt looked. This jacket is from last year but I have a really similar one linked for you above. 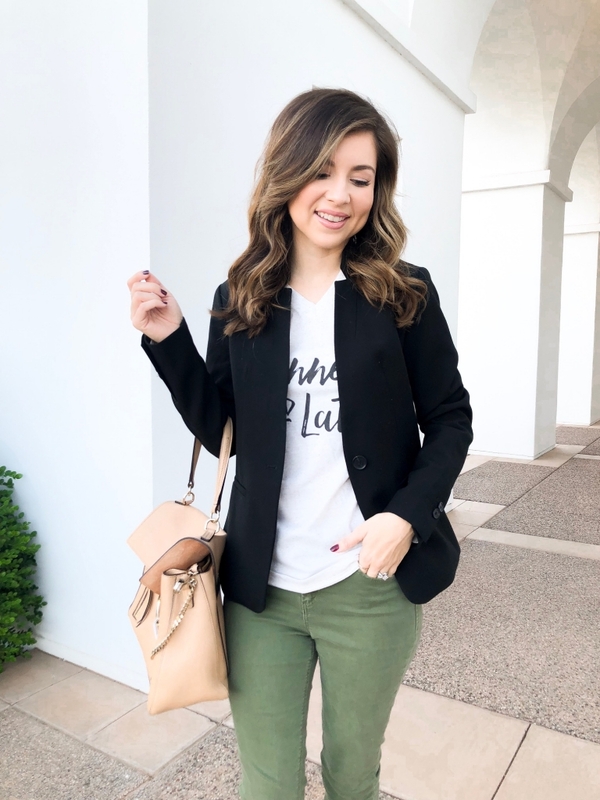 A blazer like the one I’m wearing today is a staple piece that should be in everyones closet. My top today is only $24 and where I got it they make a ton of other adorable ones! If you are looking for more inspo check out this post on the oversized shirt. In that post I’m also sharing a dupe for the Gucci shirt. I can’t believe October is already almost over and that Halloween is this Wednesday!